Styling dresses, and outfits is a fun part of my job. Instagram makes it a million times easier for me to engage with our ethical fashion community, to see what my customers are wearing, to find comfortable, functional, ethically made accessories to add to an outfit, as well as being a visual playground for style tips. and now there’s no turning back. Paired with a linen dress, it’s the perfect combination of girly chic, and comfort. Dress: Model no.12 in Black. Cardigan: Marks & Spencer in the UK. Have a patterned dress but not sure how to style it up for a day out? Add a contrasting color cardigan or jacket that has similar color tones to a handbag. powerful boss that you are. Cardigan and bag: Models own. for good second hand shops online! Nothing says ‘Eclectic, Relaxed, Intelligent, Yes-I-Brunch-Here-Daily’ like a pair of loafers and the effortless look of linen overalls. It never fails to bring delight to the ‘gram! 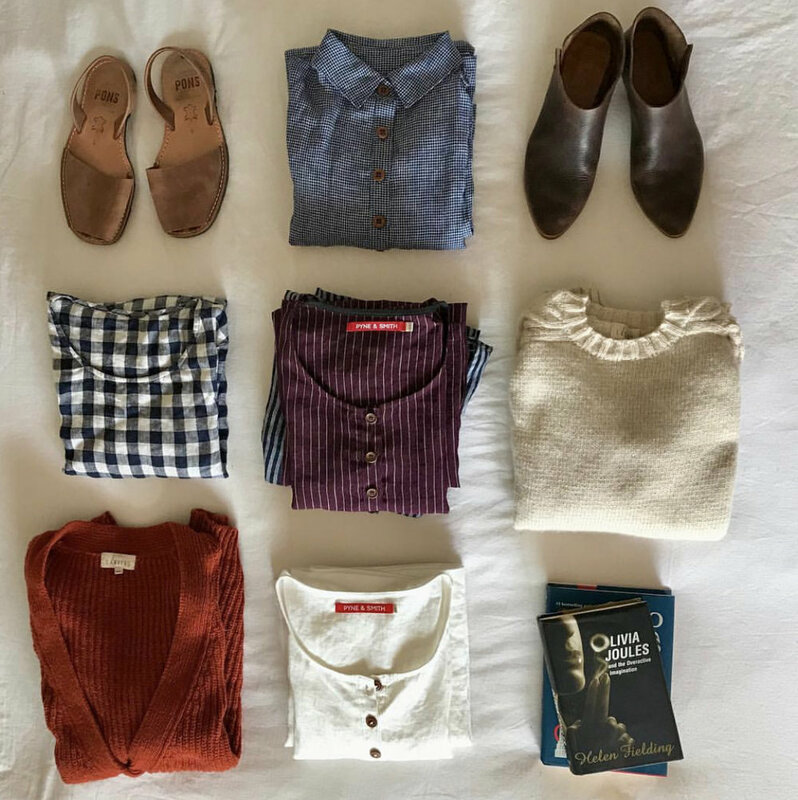 A good flat lay can be a popular post, this one was done as a genuine travel snap - prior to a trip to the UK, so it featured a range of items that I was packing. Travel tip: roll your linen clothing up before you pack it, you’ll keep it crease free and ready to wear! No iron or steamer at your destination? Just hang your dresses in a steamy shower to relax the linen. 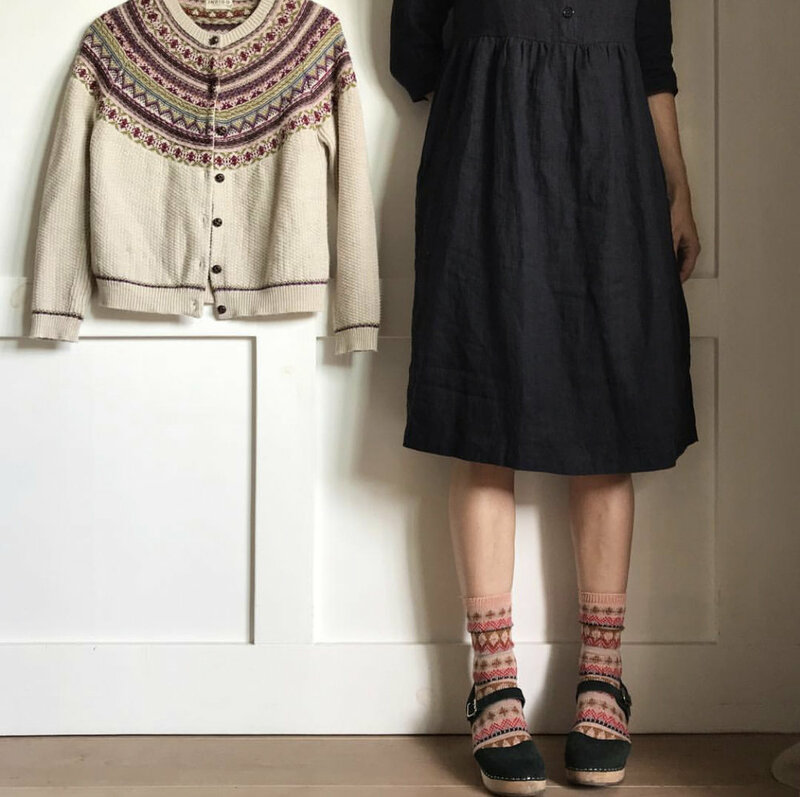 Blouse Navy gingham Linen, Model no.11 Thistle Flower Linen, Lenvers Fashion Wool Sweater. Lenvers Fashion Claude Cardigan in Brick, Model no.11 in Cloud white linen, random books.